B.A. English (Hons), a degree which is always misunderstood, understated. Maybe because the cut offs for English Honours do not go as high as Economics or Statistics honours. Or maybe because English, as a subject, is always taken for granted in school. I bet all of us are guilty of letting English take the back seat during our board exams when we had subjects like Physics, Chemistry, Maths, Accounts, History or Political Science to concentrate on. Agreed, that English is probably an easier subject to grasp in school when we are burdened with so many other subjects. However, this has resulted in a large number of students, as well as teachers and parents, treating English as a second class subject. And this mind set carries on and no one happens to consider English as a subject that one should pursue in college as their major. Conversation Start Random relative: Beta, what are you majoring in? Me: I am doing English Honours. Relative #1: Oh, so you plan on being a teacher after this? Relative #2: That’s rough. So are you doing anything else along side? Relative #3: It’s so great that you don’t care about making money. Relative#4: It’s okay. You can work your way up to a better job eventually. This just shows how badly unaware the general public is about pursuing English. “Real jobs” don’t just count as becoming a doctor, lawyer or engineer. Yes, I am not doing a professional course but that does not indicate that I will end up crawling under a rock without any jobs for the rest of my life. I can be a publisher. I can be a journalist. I can be a research assistant. I can be a speechwriter. I can work with magazines and newspapers. I can be an author. I can be a movie critic, a food critic. I can be a copywriter. I can be a news reporter. I can be a content developer. I can manage social media. I can be a lobbyist. I can be an editor. I can write for television or radio or movies. I can be a travel writer. I can work in advertising. I can do anything that I want to do. I have done my research and I am proud of the field that I have chosen. English honours might not sound as fancy as some mind numbing and technical professional degree but it is a fantastic degree to pursue if you want to learn and grow culturally and socially. 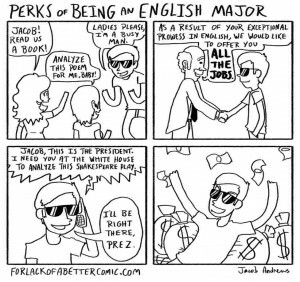 There is a lot of hard work that goes into studying English, contrary to popular belief. There are various books to be read on a weekly, if not regular basis, the works of critics to be read, analysis of characters to be done and digging up of the history, economic, political and social conditions prevailing around the time each novel has been written. There are assignments, projects, presentations, internals and external exams to be handled. Reading and writing become not just a hobby but a habit. Think you can handle all of that? 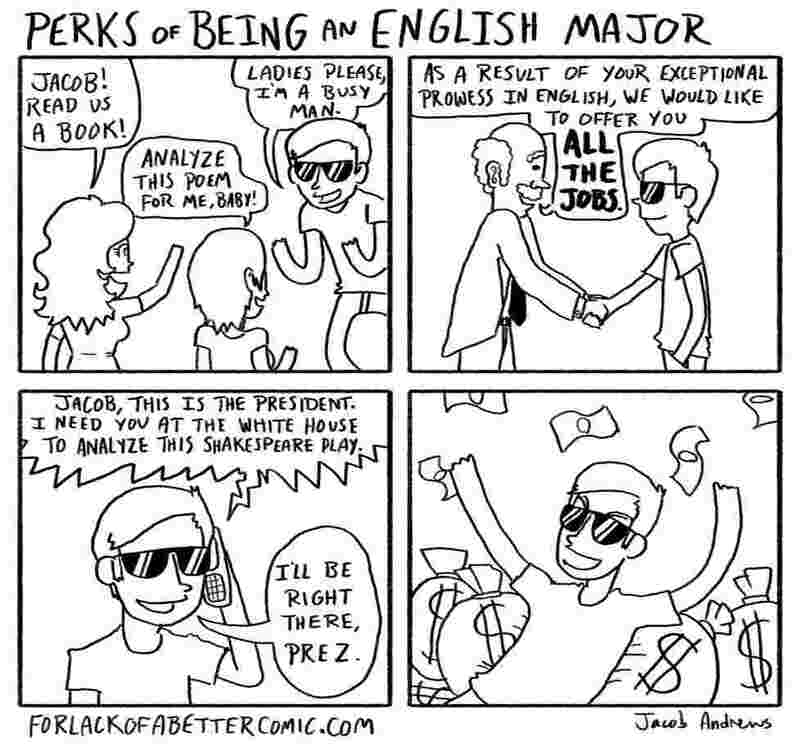 Jobs don’t come from the title of your major. They come from the experience and attitude that you bring with you. The major you choose is useless only if you let it be useless. You are the only person who can make the most out of the degree that you are pursuing. So let people judge you for picking the field of your higher education. Just remember, passion and dedication are the only things required take you to the pinnacle of success, not the degree that you have opted for. A student of English Literature at KNC, Delhi University. Big foodie, traveler and explorer. Voracious reading and writing is what drives me. I also dabble a little bit in the field of art. Constantly in search of the impossible. Without a good knowledge of English modern specialist will not take place. you said what i really faced as English major but that uncle asked me matlab simple B.A ☺☺ and my mother has to literally tell some aunty that i was 80% + marks in 12 because she thought that i have got less marks in 12 and therefore was left with no option other than taking arts subject . Uffffaafff…….. such notions really annoy at times . but its actually the zeal to succeed is important for good career rather than what others think of it . anyways thanks for such an encouraging post .